Yak City is back in Oil City, folks. Having taken some time to rest and unwind with friends and family in Russia, the Edmonton Oilers’ Nail Yakupov has returned to Edmonton and is already training hard for the upcoming season. And things are looking good for him. Given his disappointing sophomore season last season (24 points in 63 games vs. 17 goals and 32 points in 48 games during his freshman season) and his clear frustrations with the season, Yakupov could likely have come into the third (and final) year of his entry level contract with a surly attitude and unwillingness to even bother. However, that’s not the case – young Yak seems to have pulled himself up by his bootstraps and taken a far more optimistic attitude to his third season in Oil Country. Why come back early to train here instead of merely prepping in Russia? Two reasons, he says – the team and the facilities. He’s been enjoying training with Oilers prospects and old teammates such as Sam Gagner (or “Gags,” as he told an interviewer), and has acknowledged that there is far more space, gyms, and available ice time in Edmonton than in Russia. 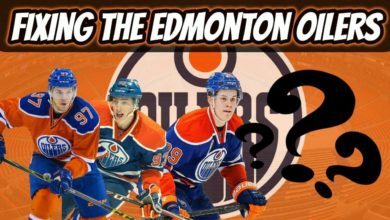 Given the Oilers’ disappointing last season, different is good. Different has the potential to make an impact. Another new change? His number. When he joined the Oilers he wasn’t able to wear number 10, his childhood number, because it was already taken by former captian Shawn Horcoff. Now, however, he’s shrugging off 64 and donning his old and familiar favorite. New number, new start. Another new development in Yak City is his living situation – he stated in an interview on Oilers Now that he was living with Leon Draisaitl, a pairing that is potentially beneficial to both. While it may be a long shot due to his relative inexperience, given all the praise he’s been getting Draisaitl definitely has a chance of making the roster, and having two young players with an opportunity to get accustomed to one another and get a good feel for each other before even getting on the ice is great. Additionally, both players are young and hungry, ready to improve their team and their own play. We’ll see how things unfold and how Eakins handles the situation, but Yak’s positive attitude is definitely a plus for the upcoming season.